This is a small instrument but it offers many different functions. 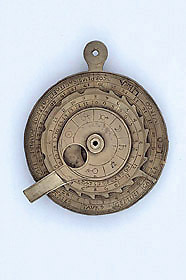 The nocturnal side, besides telling the time at night from the position of the stars, has a volvelle for predicting the age or phase of the moon. The reverse has two types of horary quadrant, a shadow square and a degree quadrant, all squeezed onto a small disk with their lines overlapping.